← As we head into winter…. This week has been cold and wet for us in the South West. We have had lots of rain. We have lambs being born and I feel sorry for them being a new born out there where its cold.! I have started feeding a baby lamb whose mother has died. So shes about a week old. I haven’t got any photos just yet but will post one next week. Wayne and I have also been looking after a puppy. Our puppy has been enjoying the company and I must say that I have been enjoying having another puppy around! 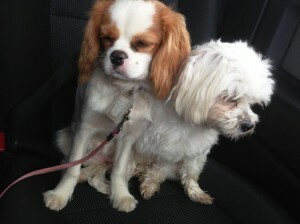 This is them sitting in the car!